“The EU’s four freedoms are indivisible,” tweeted Liberal Democrat MEP Catherine Bearder (Mission: ‘Fighting Human #Trafficking. Protecting the Environment and stopping #Brexit’). So the free movement of goods, services, capital and persons exist in hypostatic union: infallible in their doctrine; immutable in their essence; immaculate in their expression. This is spiritual-political truth: all economic power, governmental wisdom, cultural holiness, social justice and personal goodness are bound in the infinite, eternal and unchangeable four freedoms of the European Union. They are the foundational article of faith. To deviate from them is heresy; to apostatise is death; to corrupt them is akin to the sin of blasphemy against the Holy Spirit. It was the late Lord Shore of Stepney who observed in his book Separate Ways that the EU Commission behaves “like a priestly caste – similar to what it must have been in pre-Reformation days, when the Bible was in Latin, not English; the Pope, his cardinals and bishops decided the content of canon law and the message came down to the laymen, only when the Latin text was translated into the vernacular by the dutiful parish priest”. It is the priestly caste which expounds its divine revelation to the ignorant laity: it is they who defend all Treaty truth with appeals to a higher source of knowledge; theophanies of enlightenment in which are manifest all mysteries of thinking and knowing. 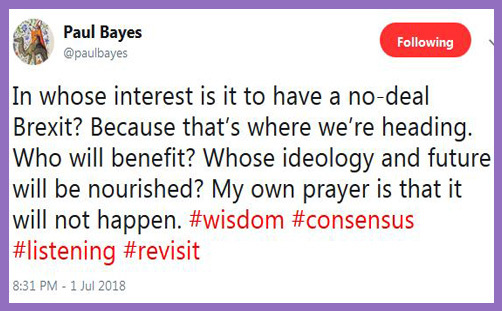 “In whose interest is it to have a no-deal Brexit?” asked Paul Bayes, Bishop of Liverpool. “Whose ideology and future will be nourished?” he probed, as though the economic ideology of the World Trade Organisation emanated from the fourth circle of hell. “My own prayer is that it will not happen,” he added, with no apparent awareness of his ideological prayer (signalling: #wisdom #consensus #listening #revisit). #revisit (a second referendum? ); #listening (to grieving Remainers? ); #consensus (at all costs? ); #wisdom (ah, of course). There is no wisdom in the sort of ideology espoused by Michael Gove, Boris Johnson or Jacob Rees-Mogg. These are the heretics of Brexit polemic, hammering their theses of deception and disunity to the door of the Church of Europa. They supplant joy, judgment and grace with anxiety and disorder. They are the false prophets of ideological destruction. St Anna Soubry has decreed so: “Time to drop the ideology face up to #BrexitReality & get a deal that meets the needs of business & secures peace in N Ireland,” she tweeted. The evil of ‘ideology’ is a favoured theme of Remainers: “My front bench… is in hock to 35 hard ideological Brexiteers,” Soubry told the BBC. They are “people seeking to put ideology before the national interest,” added Chuka Umunna. The Bishop of Liverpool feels this acutely: it isn’t simply that nothing good can come of ‘no deal’; there is simply no wisdom at all to be found in Brexit, for there is no consensus and no listening, and so the matter must be revisited (ie reversed). This is not merely the phenomenon of emotional subjectivity, but a higher understanding of being: his affection, cognition and volition are indivisible; his experience is revelatory, and so he prays the perfect will of God, for a Brexit deal is not merely a faith-conviction, but natural theology. If there is a Brexit deal to remain in (something like) the Customs Union and (something like) the Single Market, and to uphold the four indivisible freedoms of the European Union (or something like), whose ideology and future will be nourished? Funny, isn’t it, how those who routinely berate Brexit ideology or ideological Brexiteers readily make their own stipulative assertions about the truth or correctness of their own views, but are blind to their own assertive ideology. They seek to legitimate their superior course of political action with demonstrations of wisdom and philosophy, or compassion and theology, but their enlightenment is incompatible with democratic grace. ‘And the LORD said unto Samuel, Hearken unto the voice of the people in all that they say unto thee…‘ (1Sam 8:7). When the people speak, there is reasonableness. And the people voted to leave the European Union; to take back control of their own national destiny.